Home | Eisenzimmer Financial Services, Inc.
Thomas W. Eisenzimmer is a Registered Representative (and Investment Advisor Representative) of ProEquities, Inc. a Registered Broker/Dealer(Registered Investment Advisor) and Member FINRA/SIPC. ProEquities, Inc. home office is located at 2801 Highway 280 South, Birmingham, Al 35223. Please be advised that presently, Thomas Eisenzimmer holds Series 7,24 & 63 licenses and is an investment advisor representative of Proequities, Inc. a Registered Investment Advisor with the SEC. Licenses are held in Al, CA, CO, FL,IL,IN,KY,MD,MI,NY,OH,and VA. For residents of other states in which registration is not held, proper licenses and registrations must be obtained by Thomas Eisenzimmer before proceeding further. No part of this communication should be construed as an offer to sell any security or provide investment advice or recommendation. Securities offered through ProEquities, Inc. will fluctuate in value and are subject to investment risks including possible loss of principal. 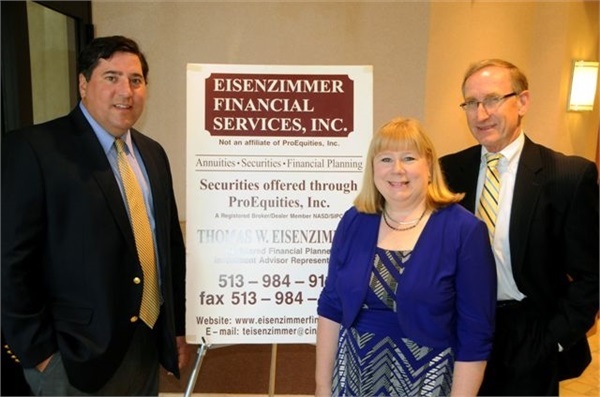 Eisenzimmer Financial Services, Inc. has held a Financial Services agreement with the Greater Cincinnati Credit Union to provide financial planning and investment advisory services for the past 18 years. Eisenzimmer Financial Services, Inc. is not affiliated with the credit union and is independent of ProEquities, Inc.